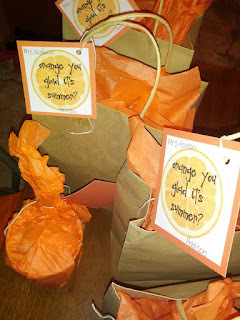 Create with Traci: orange you glad? I wanted to share with you some fun, quick gifts I threw together for end of the year teacher gifts. I found this idea on pinterest and LOVED it. I went to the Dollar Tree and Target to stock up on "orange" items: orange trident, orange summery plastic cups, orange carbonated drinks, orange cheese crackers...etc. It was a total pinterest idea (I LOVE PINTEREST) There is an online link here to the jpeg of the printable tags. I just printed 5 on a page, cut them out and backed them on orange cardstock. I thought this was super fun... and hope you do to! If you had smaller gifts you could also buy the orange bags the Dollar Tree sells (woven handled bags 2/$1) they just didn't hold all of the items I purchased.